I really do not like wearing socks or shoes once the weather turns warm. Because of this, my feet take a beating when it comes to being dry and cracked they can look a little tired. When I was asked to try footlogix I jumped at the chance so I could really put it to the test with my dry cracked feet. I want my feet to be summer ready so they look good in my sandals for the whole summer. I have made a promise to myself to take better care of myself and that includes my feet. 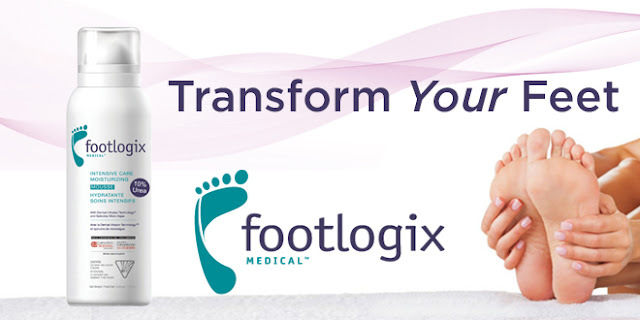 That's why when I heard about Footlogix Medical®, I knew I needed to give it a try. Footlogix Medical® is is a mousse, so it's easy to apply – it's not greasy and absorbs very quickly. You don't have to sit around waiting for it to absorb into your feet so you can be off and running right away! That's not only more convenient for you, it also means that there is no greasy layer to interfere with your foot's normal breathing. It's also formulated to carry the active pharmaceutical ingredients right into the layers of the epidermis, reaching the targeted areas of the foot and bringing relief right where you need it. Its' hygienic applicator system is sealed to prevent air from entering the container; so, as your damaged skin is repaired, it is also protected from infection. Don't just take my word for it. Pick up a bottle of Footlogix Medical™ at your Walmart in the pharmacy section. And be sure to enter to win a $250 Spa Gift Certificate. Put your best foot forward. I really loved the fact that I could use this product and my feet has no greasy feeling afterwards. I didn't have to put on socks which is something I really dislike doing unless it is an absolute must. My feet are definitely now sandal ready. Bring on the nice weather! Sponsored Post: All features are at my own editorial discretion and provide honest thoughts.